East Coast Eco Systems specialises in the Renewable energy sector and provides a complete consultation, design, specification, installation, commissioning and certification service, fully MCS accredited and approved. Various government aid and grant schemes may be available, please contact us or the Energy Saving Trust for more information. We are locally based in both Edinburgh and the North East of Scotland (Aberdeen), covering the whole of Scotland but with the majority of our work from the Borders to North Aberdeenshire, on the East Coast. Providing full ongoing support and guarantees for all systems. We are qualified heating engineers with all industry certification, including electrical and full F-Gas catagory 1 qualifications. Our specialist approach offers unparalleled expertise. Renewable technologies covered include: Ground and Air source heat pumps, Air-Air heat pumps, Solar thermal and Solar PV. Underfloor heating/radiator systems are installed, fully integrated with the Renewable sources. 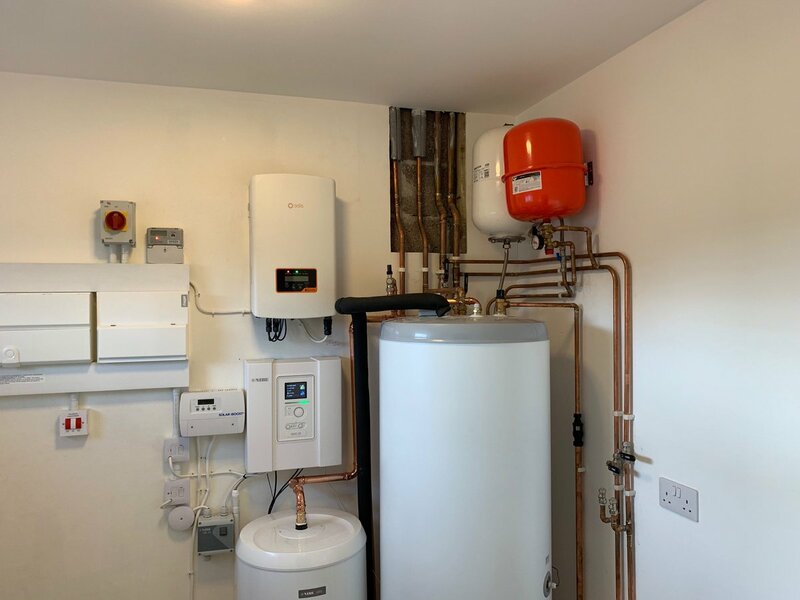 We also specialise in MVHR (MechanicalVentilationHeatRecovery) which is a rapidly growing technology to improve energy efficiency combined with providing a fresh air supply into the property. Funding schemes overview :Government backed schemes are subject to change, please contact us for up to date details. As an overview there is public funding through Renewable Heat Incentive (RHI). All new installations will fully qualify. This is the area of funding that we believe most benefits our clients. The client funds the installation and then entirely owns the product and has complete control over it, at the most competitive costs. The RHI payments are received directly by the client. There may be other government initiatives available. Another nibe 2040 system installed, performing perfectly and with pv to generate power. 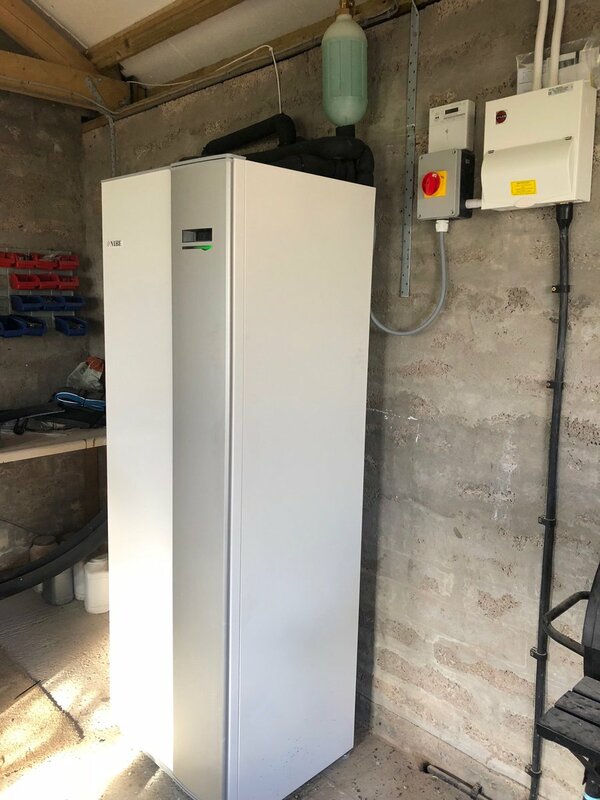 Another great NIBE 1255 inverter ground source heat pump commissioned. Solar PV (Electricity generation) installations qualify for the Feed in Tariff scheme Please contact us for full details. The domestic house must have an energy efficiency rating of band D or above to qualify for the higher rate. These are available immediately. RECC. We are also full members of the Renewable Energy Consumer Code (RECC)quality assurance scheme to further guarantee the highest quality installations. RECC also administer the new European Alternative Dispute Resolution service (ADR) which resolves any disputes regarding small scale microrenewables. The RECC website is listed under Contact/links, for more information. We design, supply, install and commission all major manufacturers but recommend the market leaders NIBE and Ecodan, these are the highest quality and have unrivalled technical backup and guarantees. We are manufacturer trained and accredited installers with NIBE and Mitsubishi Ecodan, holding full logic certification as well as BPEC. Underfloor heating is exclusively supplied from Begetube, again the highest quality available. As fully accredited installers we can offer the highest level of warranty and guarantee available. We have introduced a full consultancy and design service. The renewable heating and generation sector is growing rapidly with many new products and technical advances. There are also many myths and a lot of misunderstood information circulating. This is compounded by some sales people promoting certain products, at the expense of objective knowledge and advice. It is often valuable for a client to commission a design and consultancy service. We are experienced and fully qualified in the industry. Please contact us for further details. Recently we have added full air-con and refrigeration consultancy, including full Cat 1 F-Gas related capabilities.